Everyone talks about minimum wage and ignores the giant pink elephant in the room. Inflation. There will be great inflation with $15hr minimum wages. The people that will suffer the most will be the poor and also small business owners. For the poor, prices will go up on everything from food to clothing to housing. For small businesses in addition to labor costs, the costs of supplies,etc will go up because the vendors they do business with will also be raising prices too. I don't think we should be experimenting with the economy. Many people seem completely unaware of how many small businesses there are in Los Angeles and California. The link above which is a small business profile from the SBA should really be looked at by everyone that cares about this issue. California has the most small businesses( over 3.2million) in the country and small businesses employ over 6.4 million people. A lot of the pro $15 crowd is acting like this is just going to affect a few or handful of businesses, certainly not the case. Of all the things I have read you posting, this is probably the very most hilarious. Experimentation has always been the very engine of all economies and responsible for the growth of societies since we left the caves. Glad that you find it funny...a lot of economists ,even liberal ones are wary of this experimentation too. Jerry Brown even knows it's a bad idea, but gave up trying to explain that to people . Lot's of laid off employees and small business owners won't be laughing when they lose their livelihoods. Young people start out at the minimum wage and in 6 months get a raise and in a year another raise. Thats the way it's been for ever. It never was intended to be for older people to live on. Have we EVER experienced the rapid Cost of Living for Housing that we have now? When I came to Los Angeles in 1991 from Texas, I was able to pay for my 1 BR apt with just a little sacrifice. I wouldn't be able to do it now because apartments have become too expensive. Job markets are always changing and are not always able to support the number of applicants who are qualified for well-paying jobs. Los Angeles needs a higher wage to live on than most cities. I have not been to a movie theatre lately because the ticket price is ridiculous. That's where the most jobs for teenagers at minimum wage. At $21 an hour, forget about it. In fact I'm going to start a trend, just like UK. I won't tip because it's demeaning to the people who makes a decent wage to receiving tip. Housing was affordable in CA up until the early 2000s. It was ALWAYS more expensive than other states, but it WAS affordable. A well-built 3 BR home in a good West LA neighborhood could have been had for $300,000-350,000 in the mid 90s. Now, they go for close to $1 million. "It costs a lot to live in L.A or NYC or SF...so businesses should pay people more"
the problem is that it's based more on an emotion versus actually looking at the economics. 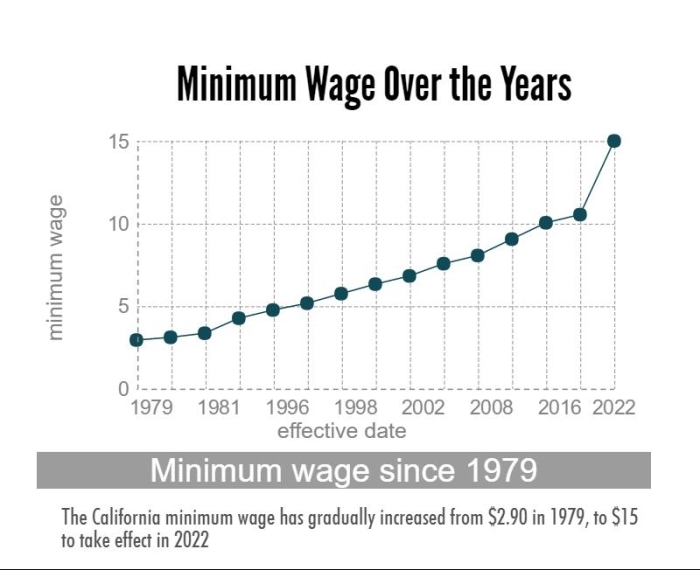 Even CA Governor stated that raising the minimum wage would likely hurt poor people ...but did it anyways. Hillary Clinton also stated hesitation ...but gave into political pressure. No doubt there is a lot of poverty in L.A , and it's never good to have a high concentration of poverty in a city. But this law will hurt the poor and small business owners (most of whom aren't rich) more than it will hurt the big multinational corporations or the 1%. Carls Jr, and McDonald's can afford to do this...but the mom and pop run place probably can't afford to automate. Also even if the big corporations like McDonald's left the city of state entirely...they still have many locations in other states and even other countries like China,etc. Mom and pop down the street usually just has their one small store. A better solution would be to improve public education , perhaps teach students skills in high school or even starting in middle school that will qualify them for something beyond a minimum wage job. Also being more business friendly and encouraging businesses to operate here rather than making it more difficult to operate would go a long way to improving employment opportunities , including higher paid/skilled types of jobs. When businesses can't afford to operate in an area, they move. Just like when many people can't afford a city anymore they move too. Yeah you are correct. A lot of new comers don't believe it when you tell them what prices were back then. Best and quickest way to get in a better financial situation for most people is to move out of the area. There is lot's of affordable housing in decent parts of the country...Los Angeles of course is not one of those areas these days. Also it seems there are a lot of people hoping that housing prices will come down...Even if they come down, it's unlikely they will come down much. Even during the housing crash those West L.A neighborhoods pretty much stayed the same. Same thing happened in San Francisco too...prices didn't really drop. The reason is that markets like the Westside were more mature and stable and many people had bought when prices were cheaper so they had their homes paid off or had low mortgages on them. Also rents remained high and many Westside homeowners if they did need or want to move out of the area had the option to rent out their homes and still cover their expenses and make some money during a 'bad housing market' . West L.A home prices are now over $1million if you are talking about a 3bedroom house. Probably closer to $1.2million for a nice 'starter' home. An average sized,modest house in West L.A.. Even if 3bedroom houses dropped all the way down to $700,000 or something in West L.A..it's still going to be unaffordable for most people. And you're sure of this based on what? Responsibility for what? is the other question. The responsibility for making a lot of money for oneself? Do you think business owners are in business because their altruistic goal is service to society? Business does serve society. But that is hardly the motivation of ownership. Businessmen and women are certainly entitled to seek their fortunes. But not at society's expense. If it's not cooperatively successful, then one side is sacrificing the other. When wages are not supportive of basic living requirements for workers they place a larger burden back on the government social services network and overall depress the economy.